Free Vending Machine Services Australia Wide No Contracts, No Obligations, No Cost! Do you want a vending machine for your workplace or business? Reliable Vending Machines are now available for workplaces large and small throughout most areas of Australia. Whether your business or workplace is located in Brisbane, Sydney, Canberra, Newcastle, Melbourne, Adelaide, Hobart, Perth, Darwin or any other large town or city in Australia we can provide the ideal vending machine for your business and our vending operators provide regular and reliable service. Customer service is our philosophy... it's all about your choice. We offer the LARGEST choice of products to choose from. ALL our products are well known Australian brands of drinks and snacks. You and your staff will have a wonderful time in deciding your choice of products to put in your vending machine. Our aim is to keep our clients... happy! Vending in our opinion is about personalised service and the confidence in our products that ensures that our clients are happy... and if our clients are happy then so are we! Our team will refill and clean your vending machines on a weekly or daily basis. Vendors (vending machines) can be positioned wherever they are at their most convenient for you and if required they can be repositioned by our team at no extra cost to you. We provide full insurance cover on all of our vendors at no cost to you. This includes damaged or broken vendors, vandalism, fire and theft. The latest machines – energy efficient, versatile, reliable! All machines are fitted with coin mechanisms and note readers ($20, $10, $5 notes) giving the exact change! We are the Experts in Vending! We supply free vending machines tailor made for your workplace, cutting down on the time that employees spend outside of the office looking for a drink or a bite to eat. Having a vending machine at your workplace that dispenses cold drinks, leading brand energy drinks, snacks, coffee or healthy products is a convenient time saving extra service for your staff as well as your customers. Enjoy the benefits of a serviced vending machine at your workplace, without any costs or obligations! We offer a vast and fantastic product range with free high quality, modern vending machines. If you are concerned about size or space being a problem, have no fear - we also have a range of small compact vending machines available for your workplace. We will restock, refill, maintain and service your vending machine at our expense. One of our vending team will call to your workplace regularly to ensure that your machine is fully stocked, cleaned and serviced. We liaise with you to make sure that we provide the products you choose. We provide an easy hassle free vending machine service. Fill out our online enquiry form and one of our trained staff will give you a call to discuss your needs. Take your pick from our large range of snacks, drinks, chocolate, sweets, coffee, flowers, ice and surprise your employees with an array of convenient food and drink options. 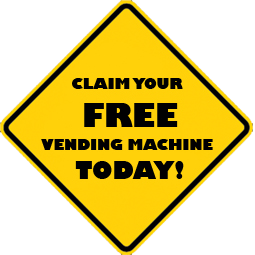 Our staff will then arrange for your vending machine (or machines) to be installed for free at a time that suits you. Once installed there are no contracts and no inconvenience to you. Our team will ensure that the machine is refilled and serviced regularly, allowing you to arrange installation and then forget about it. As tastes and seasons change, you can give us a call at any time to arrange for the contents of your machine to be adjusted throughout the year. Choose from many well-known brands as well as gluten free, sugar free, low sodium, instant meals, cough lollies, energy drinks and so much more. If you don’t have a vending machine installed in your workplace, or you are unhappy with your current vending machine give us a call to have one installed for free today. Enquire now... to get your Vending Machine installed as soon as possible.